Many bloggers have come forward to spread this message of help and hope. Inspired, we have also put up 2 copies of our cookbook. Click here if you want to know more. To convey the message of optimism, faith and positive thinking to Briana, my daughter, Manasvi’s words about my mother come to mind. She says that Nani (maternal grandmother, pronounced as ‘Naanee’) represents determination and strength because of how she has recovered from major illnesses. Manasvi says, “What I wish to learn from Nani is to have the inner strength to recover and get back to routine life as if nothing had ever happened.” Manasvi’s Nani is definitely a person to emulate in moments when one needs to have faith. She believes it is all a matter of shedding one’s karmas as lightly as one can. 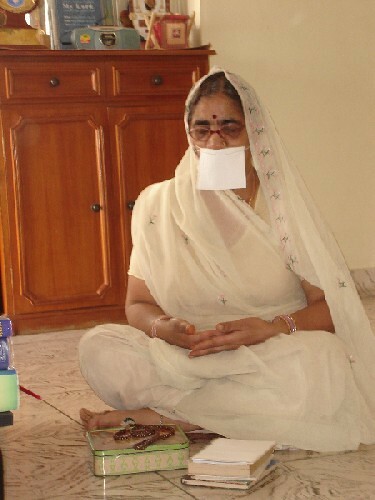 On this note, today’s post is about Nani, Shrimati Anoop Jain. My first memory of Nani, as far back as it will take me is that of her cooking & cleaning. She could never stand a mess. I remember following her around with a small cloth over my shoulder trying to imitate her. 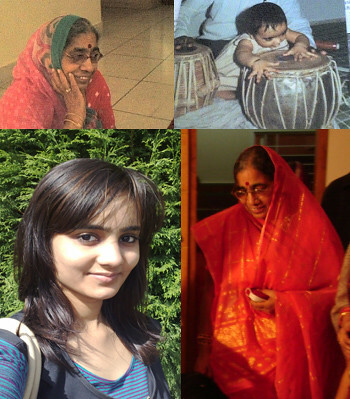 I have very few memories of being a child, but the ones I have are filled with images of Nani, my maternal grandmother. I know I spent most of my childhood at Nani’s place because my own house was always a hub of activity, being part of a large joint family. I remember Nani poring into religious texts for long hours. Today, as an adult I realize that she was and is keenly interested in religious debate and finds her answers in age old books of wisdom which are so much thicker than my reference books in journalism! In fact, my Nana who is a writer and speaker makes sure that Nani reads his articles and attends his lectures, because in his own words, Nani is his most ardent and constructive critic. I am Nani’s eldest grandchild and that I say very proudly because I get to boss around my younger cousins which I love doing. The one after me is 6 years younger and being the pampered one that I was, I remember not liking the little baby who got everyone’s attention. I also remember going up to Nani and asking her “Nani, I will always be your favourite grandchild, won’t I?” I recall her warm hug as she allayed my fears with a simple and straight one-word response – “Obviously”. As I grew up, my trips to Nani’s house have never reduced. She has always made sure that a bowl of cool, pomegranate, my favourite fruit, is ready for me in the refrigerator along with something yummy to eat. If she and my aunt (her daughter-in law) cook something that I like, and honestly, both of them are such awesome cooks, they will make sure that I go there to eat or send it home for me. Now when I call her from Birmingham, her loving voice calls my name ‘Manas’ and that lights up my whole day. When I first made my decision to come here to study, Nani was a little hesitant about sending me. She was worried about how I would manage alone because till I came here, I was never alone. I was always a hop, skip and jump from my place to a friend’s or Nani’s. I have never been alone. And she was worried about my food, how I would cook alone, and manage studies and the house. But after I sat her down and spoke to her, she agreed, albeit, half-heartedly. I know she’d give an arm to have me back home although she is truly happy for me now. When Ma came to visit me recently, Nani and my dad sent a whole suitcase full of things (mostly eatables) for me. Nani actually sent me a large packet of coarse Almond powder which she had ground herself! I know what an effort that must have been! I enjoy using it in my cooking and I know I don’t have to scrounge. This lot is going to last me for a long time to come! 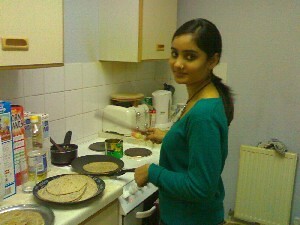 And she had sternly instructed Ma on what to make for me while in UK. I think Ma cooked a lot more for me than she would normally have, so as to appease Nani. Ma knew and understood that for Nani, more than her daughter travelling to UK, the important thing was that her Manas would be taken care of for those few days. 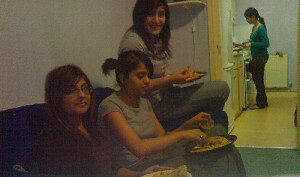 Nani and Nana still worry a lot about me, especially about whether I eat right. I keep telling her that I cook, not just for me but also for friends whom I invite over to my place. I even sent Nani the above pics as a proof to show her how many rotis I made when Ma had come and we had invited my friends over for meals. But I guess I will always remain Nani’s little Manas and she will always worry about me. For isn’t it in the nature of love to worry? Nani and I write long letters to each other. Despite all the emails I receive, I cant believe how much more exciting it is to see Nani’s hand written letters. I’d love to be a little child just this once so I can proclaim, “My Nani is the bestest”. 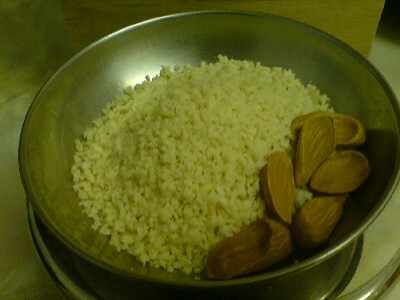 Soak the almonds in warm water for a couple of hours. Peel and grind into a coarse mixture. In a wok, heat the ghee and add the flour. Lower the flame and with a broad spatula, stir the flour continuously so that it is evenly roasted. 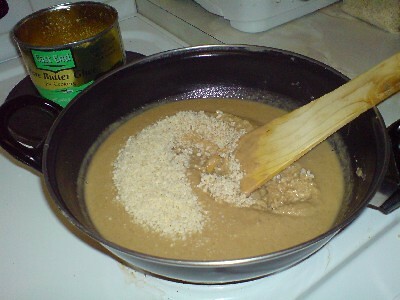 After 5 minutes, add the powdered almonds. Continue to roast for approx. 3-5 minutes or until the flour mixture turns deep brown. In the meanwhile, boil the water in a vessel. Now, add the boiling water to the flour mixture slowly. 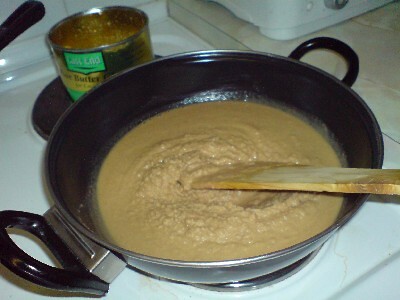 Increase the flame and stir gently in one direction to avoid forming any lumps. Within 2-3 minutes, the water would have been absorbed completely. Lower the flame and add the sugar and continue to stir for a couple of minutes. My Nani’s delicious ‘aate ka sheera’ is ready. In the pic. below, I made it for breakfast along with another dish I love, Tempered Flattened Rice (Pohe). Nani likes to grind the almonds in the Anjali chilli cutter since they get powdered evenly and don’t become pasty. Since Nani knows that I don’t have much cooking time because of my course, she dries the ground almonds by spreading on a kitchen towel on the terrace under the bright afternoon sun. Dried in this manner, I can keep the mixture for months in the refrigerator. Sometimes when I miss home made almond flavoured milk, I add 2 teaspoons of this mixture to a cup of hot milk with sugar. It tastes yumm :). Ma always makes the roasted flour mixture (with the ghee and ground almonds), packs it into smaller containers and sends it to me. I store them in the refrigerator. Whenever I want to eat the halwa, I just remove the required quantity of the roasted mixture from the fridge, do steps 5 & 6, and and within minutes, the sheera is on my plate. A couple of months ago, for a friend’s birthday, I promised to bake a cake. However, I remembered my promise 20 minutes before all of us were to spring the surprise at her doorstep. I made this same sheera, decorated with nuts and reached her doorstep with my sheera-cake. Since then, this has featured as a cake at many birthdays. Nani really had a hearty laugh when I wrote to her about it.